The below video features highlights from the First Mass of Thanksgiving for Father Jason Barone of the Diocese of Charlotte, North Carolina. Following his ordination in June 2012, Fr. Barone chose to offer a Solemn High Mass at the outset of his priestly ministry. Posted on August 7, 2016, in liturgy and tagged beautiful Catholic Mass, evangelization, fr jason barone, solemn high mass. Bookmark the permalink. 11 Comments. The Vatican did create what was considered a successful (hermaneutic of continuity) Mass. It was the 1965 Missal. 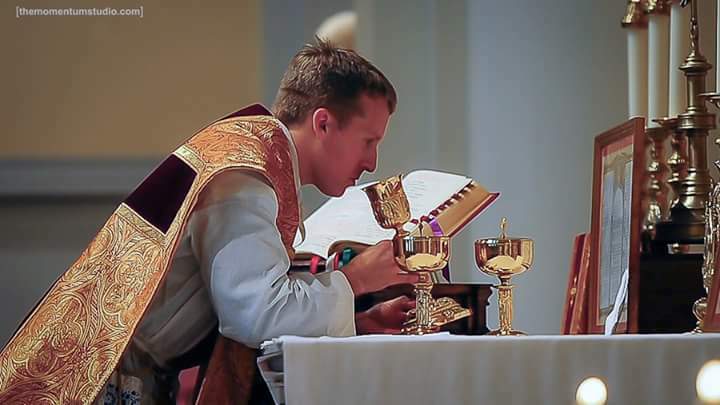 It was the Tridentine Mass, with basically the prayers at the foot of the altar and the last Gospel removed, but with everything else in the vernacular. This was usurped by the Bugnini Novus Ordo within about three years. This is how we know that there were problems, and that the Novus Ordo was not a natural progression of the Tridentine Mass. The usurped 1965 Missal was really the natural progression of the Tridentine Mass. Apparently even the SSPX celebrated the 1965 Missal in the vernacular. Did you know that Pope Paul VI’s closest confident (who also oversaw the Bugnini group) later admitted that neither of them questioned the development of the Novus Ordo (as both believed that they were OK with the developments). He later said that neither of them was happy at all with what was going on. If you don’t think this is true, then I would add that later on Pope Paul VI at the first Pentecost after V2 said “where have all the wonderful prayers of Pentecost gone?”, the response was/// “you had them removed”. He was absolutely clueless. Pope Paul the VI had a serious mea culpa moment after V2 and went into a short silent retreat. He later talked about the “auto demolition of the Church”. Thank you, Lincolnshire Catholic, for this information. It’s so helpful to have an explanation for why things happen, and yet it’s heartbreaking at the same time. Yes and my point is they changed things. Removed things. Change nothing except that those participating in the Mass can understand the language spoken. I do know the history I even know the language chosen by God him self was Greek, changed approximately around 190-202. No one knows for sure when. I ask again why can’t the only thing changed be the language spoken. Nothing else just what language the people hear. It seems so clear when lectio divina is applied to 1 Cor 14:2-17. Are we so used to the ‘traditions of men” that we can’t tell the difference between it and “The Traditions handed down by the Apostles. Even the Holy Spirit on the day of Pentecost translated what the Apostles said so that each heard in his own language. Acts 2:2-13 And after meditating on this scripture I can see why so many are confused. As always I submit to the dogmas of the magisterium and pray that all change comes by way of the Holy Spirit amongst the Church and will not abandon Her because of my own misunderstandings. Love in Christ. Wait a minute we actually have a version of the old Latin Mass being retained but said in the vernacular common language of the people in the Trinitine Mass?? No way I been thinking how great the Latin Mass would be if it also was done in englush but retaining the same words. Just translated so we all could understand it. Perhaps have it alternate one week in English one week in Latin. Although I do appreciate the lay people having more or a role in participating in the new mass I wish some more of the prayers and procedures we included from the Latin Mass like communion rails and the priest being accompanied by an altar server holding a little cake as the priest takes back the extra Eucharist to the tabernacle. Well now, I and many others think the Latin Mass wouldn’t be the Latin Mass without Latin, so now what do we do? None of us like the division. One of the marks of the Church is unity and we crave that unity. We ask the Holy Spirit and He will reveal the truth. There’s an old saying, “The truth will out.” Somehow the truth does make itself known if you keep yourself open to it. The New Mass was imposed upon the people, and they left the Church in droves. Perhaps that’s a simplification, but that’s how I see it when looking back. Now it’s young people returning to the Tradition of the Church as though they’re rediscovering a treasure that had been thought lost. You look around at a TLM and you see young people and lots of children. And on the altar it’s young priests like Fr. Barone. I find myself amazed and awestruck. Call me a romantic, but I believe the Holy Spirit is ignoring all the arguing and temper tantrums of us mortals and quietly bringing about that springtime in the Church that Pope St. John Paul II spoke of, or you could say prophesied. What you are giving me is a glorified Anglican service. I truly wish to see more joy in the eyes and expressions of we Catholics. If I were a non believer I would look for joy in the worshippers something the world does not give.